To follow up my entry on "Sinkholes," and maybe blog oftener, I'm going to try to write a bunch of short(er) posts about various things on my mind, many of which will be fertility related (but not necessarily all). It's hard sometimes to break my thoughts into smaller topics, because one thought leads to another to another in my mind. But I'll try! Today....Thinking more about a one child family. What would it be like to stop the trying to conceive business? In my entry called "Release," I talked about an experience where I felt happy to be a one child family. That was a lovely afternoon. I was profoundly content that day! It also wasn't the whole picture. I almost always refuse to let myself visualize AJ as an older sibling, or to picture how we might arrange our lives around two, because it feels too painful to dwell on a possibility that stays on the outside of reality. People cope with infertility in different ways; avoidance is one of mine. I squirm when other people "go there," no matter how innocently. That's protected emotional space. Back away! On the other hand, I have become aware of a few things that could help me be at peace as a one child family. I'm not sentimental about babies. Maybe infertility has given me a cold dead heart, but I have no particular attraction to other people's babies. I'm jealous that they have the choice to have a baby, not of the actual baby so much. I loved AJ as a baby, but I don't miss her as a baby. I love the person she is and is becoming. It is awesome to be a mother to a toddler and to contemplate all the possibilities that await. We have a family vacation to the ocean planned for the summer! Squee! And the thousands of dollars we could spend on treatments: How about taking a bigger AJ to Europe and Greece next year instead? That won't happen if I'm pregnant or parenting a young baby, but it likely can happen if I'm not. The bottom line is, it is still painful to contemplate not trying any longer, or trying with such a reduced level of hope and intention that it amounts to not trying. (I'm not sure where that boundary is, for me.) Along with the pain I also have some awareness of the benefits of one child, even if that is not truly our choice. Day to day, I find I can't only focus on the painful part or the peaceful part. I have to try to accept them both at once. It's weird. But this is our current reality, and my family means enough to me that I must have the courage to embrace all the feelings at once. 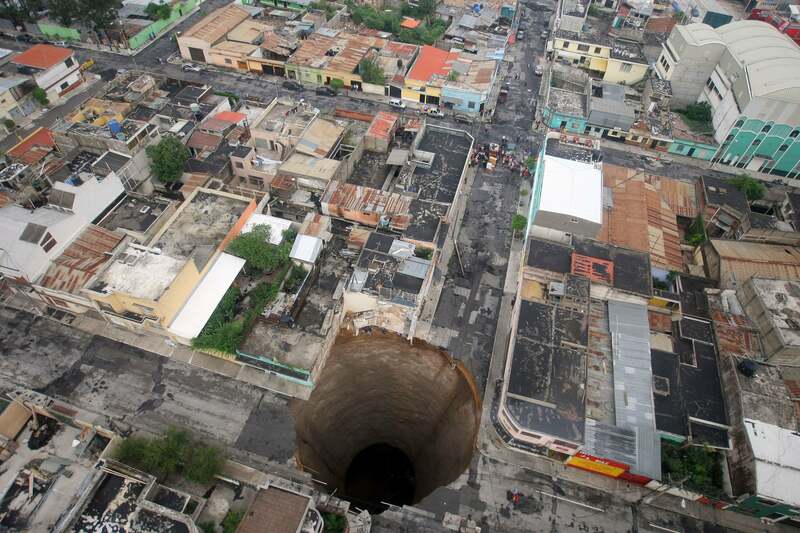 Have you watched the documentaries on sinkholes? Terrifying, aren't they? I feel like I've had emotional sinkholes lately. I'm going about my day, doing things I ordinarily do, and it suddenly feels like....a piece of my identity, my self, isn't there. I feel vaguely like a liar, when I try to talk about myself to someone, because I don't know if what I'm saying is true. And my words feel dangerous, like they might tear open unexpectedly savage wounds in myself or others. Although I'm not trying to fool anyone. I'm not trying to hurt anyone. I'm hoping this is some combination of ending a cycle (yes it still bothers me, especially the ones that are more "normal," but don't result in pregnancy), waking up at 3:30am, and maybe not blogging often enough. I've felt this way before, at times of transition and flux. Somehow though, I thought I was done feeling that way. You know, married, established career, mother, financially stable. I thought those feelings belonged to my 20s or earlier when I didn't have any of those things and life was much less predictable. I guess it's less predictable than I thought, and I'm less stable. It's not a pleasant feeling. But at least I know myself a little better, and I know that I've been here before. Well, my fears did not come to pass and the week was quite enjoyable. I went to the zoo with AJ and my mom; I had a wonderful visit with a friend who has an irregular schedule; and I had a couple of days to myself with AJ in daycare to get a haircut, go shopping and even work in the yard. (So productive!) A old friend from overseas sent me a long letter and I spent many hours thinking about it and what to write back. By the time Friday came around I was ready for a low key day and I did not find my own company oppressive at all. And to wrap it up, on the weekend Mr. Turtle took a few hours off schoolwork and we went on a date night. Apart from the fun stuff something I appreciated about this week was practicing release. I have thought about what word to use and I like "release" better than "taking a break" or "not trying" or "just relaxing" (ugh!). We are in between tests and treatments (if there even will be more treatments) so I have been taking my supplements and charting BBT/CM/Ovacue and timing our dates with fate based on that. It's been going "well" in the sense that my cycles have been fairly predictable, but at the beginning of this cycle I wanted to do less. I decided to stop the supplements other than the prenatal and one CO Q10 pill. Mainly I was tired of trying to remember to take pills 3X a day and feeling guilty if I forgot. This way I take them once a day whenever I remember and then I forget about it. I took my BBT once at the beginning of the cycle, but then I got sick, and started waking up at a different time, and it was just easier to not bother. Same with the Ovacue readings: once I missed the first ones, it was easy to stop caring. I paid attention to CM because I can't help noticing it, so it's not extra work. And I took OPKs, but only 4, not the whole box. We did our thing when it seemed right, but because I'm not temping I did not confirm ovulation. It feels good to care less (certainly I do still care!) and it's good to know that I am able to let go of the incessant monitoring, and life goes on. I also had some thoughts about family size and what it means. We went to a world-famous paleontology museum on the weekend as a family. After seeing a few exhibits, AJ started to get fussy and over-stimulated and asked to do the "puzzles." So we backtracked to a lobby in between galleries with soft chairs and coffee tables (brilliant). The coffee tables were inlaid with puzzles and other hands on activities (also brilliant). Mr. Turtle and I sat on the couch while AJ amused herself with the puzzles. I had a chance to observe other families going through. Usually, it makes me sad to think that AJ might not ever have a sibling, but as I watched families trundle past with two or more kids in tow, I had rather different thoughts. I saw clunky strollers (some doubles and/or with several "levels" weirdly balanced on top of each other) being maneuvered perilously through doorways, sometimes with one hand. Mothers (and some fathers too, in fairness) chasing one child, trying to pacify the other, feeding the next one, juggling crap, putting out fires. And there were Mr. Turtle and I, canoodling peacefully on the couch while our toddler played happily and quietly by herself. Wow, I thought to myself, we have it so much easier. And I felt especially grateful for no stroller. Strollers were never my favourite part of infancy and I'm so glad we can easily leave it behind for a trip like this. There's even a chance that I can go to a museum and enjoy an exhibit, maybe learn something about the Mesazoic and Cretaceous periods. It's not guaranteed by any means, but it's within the realm of possibility. It didn't look like any of the mothers with two or more children, especially close to AJ's age, were likely to remember a single thing about the musuem when they were done. I would still rather things were different. I would still choose to be one of those families wrangling two children through the musuem and wondering when this is supposed to start being fun. Many times, I still want that mythical second child so badly I can feel it like a physical ache. But, I also made a small mental note that there are advantages to our current situation. I have considered this side of the matter berfore: I have forced myself to contemplate life with one child because that was always a likely possibility. But what was different this time is that the thought of one child gave me a distinct tickle of happiness. We carry on. But somehow, I feel freer. Released. There is another colour in my emotional spectrum, even if it isn't one I see every day.